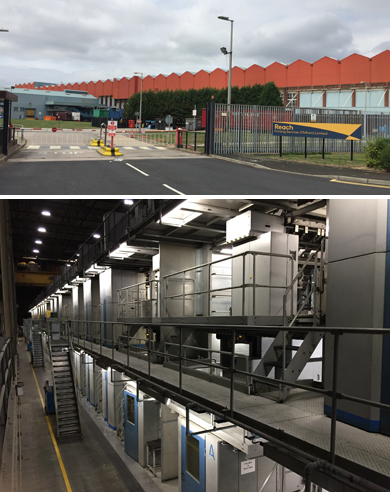 UK newspaper publisher Reach - the former Trinity Mirror business - has tappedEAE to upgrade control systems on its Wifag press in Oldham. Reach publishes the national Daily Mirror, Sunday Mirror, Daily Express, Sunday Express and Daily Star as well more than 240 national, regional and local newspapers, and Reach Printing also produces other contract work. Oldham is one of the unit's two biggest sites (the other is Watford) and the largest by volume, complementing facilities in Birmingham, Cardonald (Scotland), Luton and Teesside. A Wifag Evolution 371 there, originally commissioned in 2006 and later expanded to 19 towers overall and six folders, is equipped with EAE controls including eight Baltic Star consoles. IT systems manager Alan Marsden says equipment failures had increased the risk to production, and spare parts for computers were getting harder to source: "On top of that, support for the operating systems we use has been withdrawn." All the PCs on the Wifag's EAE systems are to be retrofitted in a turnkey programme which does not disrupt or interrupt production workflows "any more than absolutely necessary",. EAE will install eight new control console PCs, 12 section control PCs, six for the reporting and logging system, two Info Remote workstations and one service PC, plus four replacement units of the various PC models. On the software side, there are updates to EAE Info and the RMOS and Windows operating systems. Work started this month, with systems and software to be configured at EAE in Ahrensburg prior to installation.